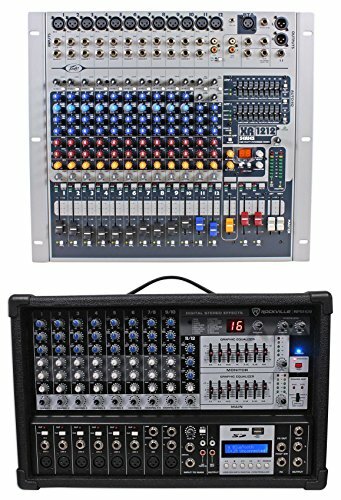 Peavey XR1212P 12 Channel Console Style Mixer. Dual 600W amps lightweight Class D. Auto GEQ. Feedback Ferret®. 4-band EQ on input channels. Digital effects. Rack mountable. Dual 9-band graphic EQ. Two monitor sends. Dedicated effect return fader. 12 XLR mic channels. Weight Unpacked: 22.05 lb(10 kg). Weight Packed: 26.46 lb(12 kg). Width Packed: 19.875"(50.4825 cm). Height Packed: 21.5"(54.61 cm). Depth Packed: 9.75"(24.765 cm). Rockville RPM109 10 Channel 4800w Powered Mixer, 7 Band EQ, Effects, USB, 48V. RMS Power Output:......600w x 2 @ 4 Ohm......450w x 2 @ 8 Ohm......1200w x 1 @ 8 Ohm. Program Power Output:......1200w x 2 @ 4 Ohm......900w x 2 @ 8 Ohm......2400w x 1 @ 8 Ohm. Peak Power Output:......2400w x 2 @ 4 Ohm......1800w x 2 @ 8 Ohm......4800w x 1 @ 8 Ohm. 10 Channel mixer section: 6 mono channels, 2 stereo channels. 1 dedicated USB/SD input. Built-in Bluetooth playback. Studio-grade stereo FX processor with 16 presets including reverb, chorus, plate, delay, chorus, cathedral and various multi-effects. 8 high-quality mic preamps with switchable +48 V phantom power for condenser microphones. 3-Band EQ (high, mid, low) per channel. Pad Switch on each Mono Channel. Clip LEDs on each Mono Channel. Dual Stereo 7-band Graphic EQ allows for precise frequency correction of monitor and main outputs. Selectable stereo (main L/R), double mono (main/monitor) or bridged mono amplifier operation mode. Monitor Level Knob with 5 LED Level Meter. Main Level Knob with 2 x 5 LED Level Meter. Dual 1/4" Stereo and Dual RCA Aux Input with Independent Level Knob for External Signal Sources. Internal switch-mode power supply, noise-free audio, superior transient response and very low power consumption. 1/4" Foot-switch Input connector. Dual RCA REC Out. Dual 1/4" Monitor Output. Dual Speak-ON jacks for Monitor Output. Dual Fan vent Cooling System. 110-120V power supply. Dimensions: 18" x 11.22" x 11.41". Weight: 30.9Lbs.